Let’s 6rd! | CCIE, the beginning! ← WCCPv2 and Squid-cache v3.1, a nice couple. 6rd mechanism belongs to the same family as automatic 6to4, in which IPv6 traffic is encapsulated inside IPv4. The key difference is that with 6rd, Service Providers use their own 6rd prefix and control the transition of their access-aggregation IPv4-only part of their networks to native IPv6. In the same time, SPs transparently provide IPv6 availability service to their customers. 6rd is generally referred as stateless transition mechanism. In stateless mechanisms an algorithm is used to automatically map between addresses, the scope of mechanism is limited to a local domain in which devices, mapping device (6rd BR) and devices that need mapping (6rd CE), share a common elements of the configuration. On a gateway device, we need to specify a specific address or a range of addresses (not used elsewhere) that will represent another range of addresses. The router relies on the configured statement which address (all bits) to translate to which address (all bits). Which is done independently of devices whose address needs to be translated (inside local/outside global). For redundancy we need additional configuration to synchronize connection state information between devices. for example SNAT(Stateful NAT failover). Customer CE routers generate their own IPv6 from the delegated 6rd prefix from BRs (Border relays). Both CEs and BRs encapsulate IPv6 traffic into IPv4 traffic by automatically reconstructing the header IPv4 addresses from IPv6. For end-to-end testing I am using Ubunu Server version for client host behind CE and Internet host. 6rd address planning depends on each SP. IPv4 bits must be unique to each CE to show the flexibility of the configuration, I fixed the first 16 bits (10.1) as prefix and the last octets (.1) as suffix and attributed the third octet to CEs. We need a couple of static routes to make 6rd work in lab conditions; generally, BR announces client assigned IPv4 to clients to Internet. 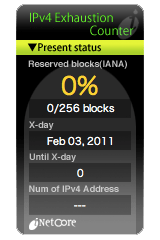 * Note the CE WAN interface fa0/0 is only enabled for IPv6 to be attributed a link-local address. Fa0/0 IPv4 address is generally assigned by IPv4 DHCP. If the ISP assigns private addresses, CGN NAT44 is needed at the BR to translate them into global IPv4. 6rd prefix is delegated not to CE fa0/0 WAN interface but CE inside LAN interface fa0/1. This way the customer LAN can benefit directly from the globally IPv6 address without interrupting IPv6 address continuity and the same prefix can be assigned to client IPv6 network using SLAAC (stateless auto configuration). A recursive (output interface + next-hop) IPv6 default route points to the BR tunnel interface. 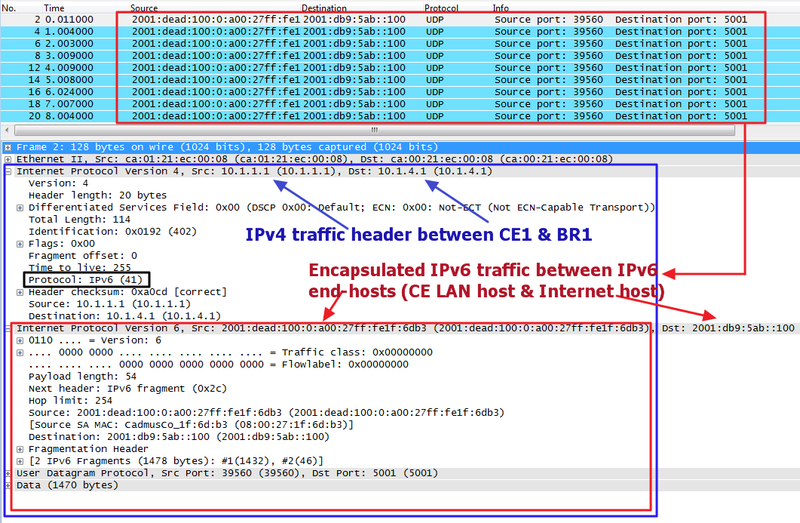 As shown by the debug, the end-to-end IPv6 traffic is encapsulated into IPv4 packets between CE and BR. WARNING: delay too large, reducing from 1.2 to 1.0 seconds. [ 3] WARNING: did not receive ack of last datagram after 4 tries. We can use “mtr” command to check the performance of the end-to-end (linux-to-linux) communication. The default MTU on IOS is 1480 bytes, so the maximum IPv4 packet size encapsulating IPv6 is 1500 bytes. Using a redundant BR, there is no guarantee that traffic will be handled by the same BR, so fragmented packets are lost between BRs è BR anycast IPv4 + IPv4 fragmentation is not recommended. Configure the same IPv4 MTU everywhere within the IPv4 segment and (DF=1) to disable fragmentation. Enable PMTUD to choose the smallest MTU in the path of CE-to-BR communication. DO NOT Filter ICMP messages “Packet Too Big” and “Destination Unreachable” at routers and end-hosts, they provide inf. about transport issues, worse than traffic black hole is a silent traffic black hole. One Response to Let’s 6rd!